Is using vibration into the tongue an alternative to the eye building the sensation of upright balance ? Can visual information about head position be substituted through a vibrating plate lying against the tongue buzzing in a vibration according to position of the head moving by pivoting straight forward or backward then either tilting to the left then tilting to the right? Let’s examine the basics: information to the brain is not dependent on which sensory system, but basically using different wavelengths of light hitting the retina acting then through the optic nerve information gets into the brain to be interpreted as the visual scene. The eyes orient to the horizon that lies at the periphery linking the head’s position within our gravity field, essentially telling us where up and down is. Move your head automatically your eyes move, smoothly tracking onto any distant object. 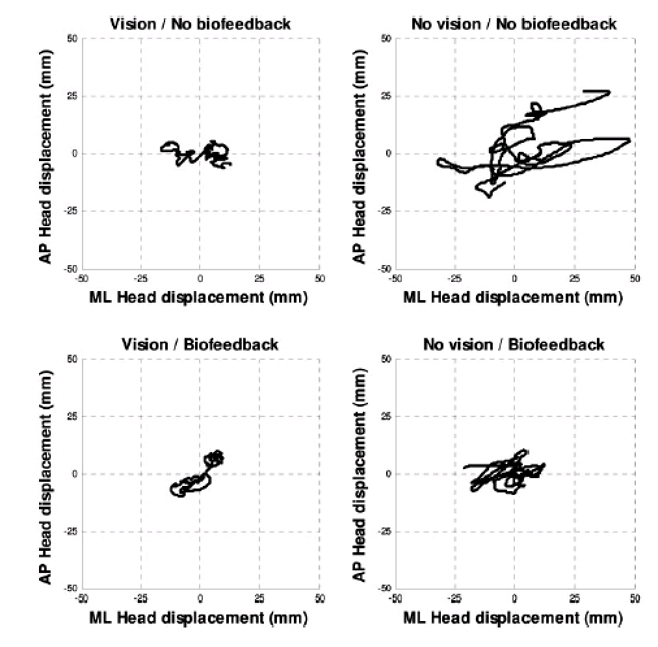 I mentioned from a recent cerebrovortex blog essay how the eye muscles meshlinked positioning sensing into the vestibular balance network as going off following a concussion. Can the head orientation from visual information be substituted as simply information transformed from wavelengths of different colors into a vibration sensing meshlink via the tongue’s sensory input blend with vestibular integration? Can the brain transform balance position as a visual signalling information within a network, can this information be transformed to correctly interpret head position without vision in terms of sensing vibrations from different positions onto the tongue on a intraoral vibrating plate device ? Let’s examine the amazing evidence, it looks like the tongue vibration transformation can happen even in the absence of vision. The tongue was chosen by the researchers, ” …as a substrate for their electrotactile stimulation site,” picked for it’s specific neurophysiological characteristics, it’s full of nerve endings. Because of its dense mechanoreceptive innervation, it has a large somatosensory cortical representation. 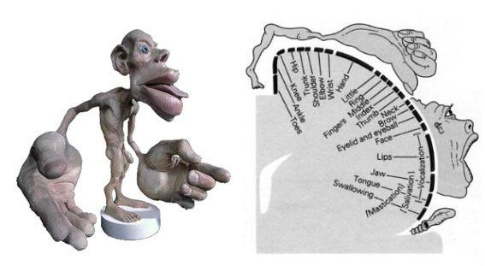 If you look closely on Wilder Penfield’s Homunculus representation of the cortical territory devoted to the eye is similar to the cortical zone devoted to the tongue. Isn’t information once inside the brain the same information even if the detail from delivery is compromised? Transforming vision information as if vestibular integration for vertical gravity orientation via plate vibrations onto the tongue’s surface a accomplishes the same task, the tongue’s vibrotactile stimulation tells the inner balance coordination network where the head is. 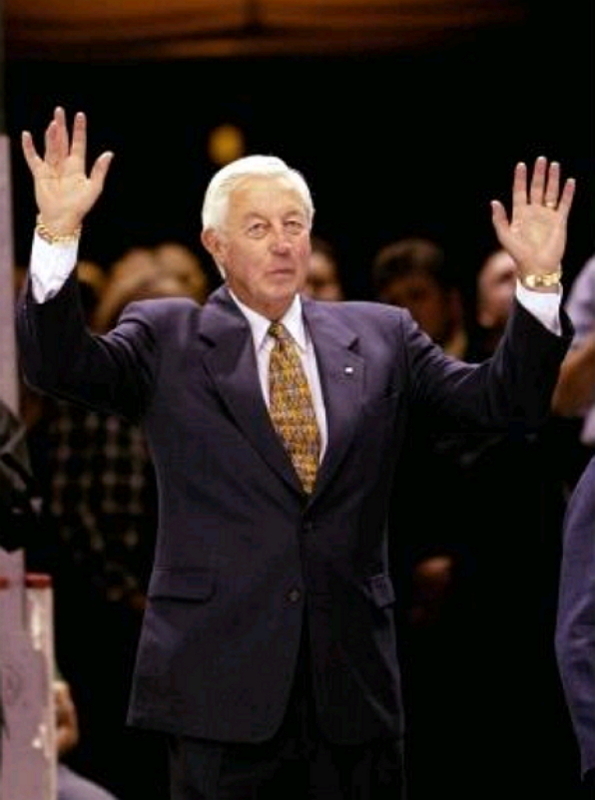 Celebrating his 81 st birthday, one of the most beloved Montrealer hockey heroes of all time, le Gros Bill, Jean Belliveau was recovering at home with his beloved wife, Elise, at his side. Rehabilitating from a severe stroke suffered a few months ago, Feb 27. In the world of hockey there is no other shinning light for the Montreal Canadiens Club du Hockey than 10 Stanley Cup champion than their former Captain, Jean Belliveau. Yet Belliveau is not a complainer but the fragility of acute balance control for Belliveau is clearly working on his mind, he wobbles easily on his feet while just standing up. So are there remedies out there that can bring back the balance of the Jean Belliveau’s of this world? One of the great neuroscientists who has ruptured our preconceptions of neurological rehabilitation is Paul Bach-y-Rita MD who unfortunately died 3 years ago after changing his career as a result of what happened to his father. Bach-y-Rita father recovered dramatically from a stroke developed by Bach-y-Rita’s brother. It was this stimulus from his own father’s recovery that led him to explore sensory substitution as a means to get around a damaged sense, like the sense of balance. I have been doing a huge amount of reading over the last few weeks about balance and especially how important balance is linked with vision. So how to boost the vision capacity if the eyes are damaged like in a stroke, it may not be vision per-se it may be the whole control apparatus of the eye muscles that could be involved. The eye processing consumes 80% of brain power so that any associated sense like balance linked with vision will have significant impact within the brain. Paul Bach-y-Rita also championed what he termed, “..nonspecific diffusion neurotransmision,” usually referred to as volume transmission. Here in the words of a review abstract are the appreciation for Paul Bach-y-Rita’s life work. “Bach-y-Rita’s clinical results in restoring lost sensory function are based on several phenomena not widely appreciated in cognitive science. First, there is volume transmission. Extensive laboratory observation has shown that the brain is much more than a network of synaptically connected neurons. Bach-y-Rita has found that a key implication of volume transmission is that it is a functional component in adult brain plasticity, also widely observed experimentally. Plasticity has led him to conclude that the structure of brain dynamics is beyond the scope of algorithmic computation. If the brain is not a computer, this insight would have a significant impact on the development of new technologies based on brain function. Bach-y-Rita’s work is being extended from restoration of lost senses to the creation of new senses. This in turn could lead to a new technology of “wiring a human-in-the-loop” that would be utterly unlike any computationally based technology. Instead of mere interaction with a machine, the human “becomes one” with it. ” (J Integr Neurosci.2005 Dec;4(4):551-65. Some radical implications of Bach-y-Rita’s discoveries. Kercel SW, Reber AS, Manges WW. Let’s assume volume transmission brain plasticity interacts within the vestibular circuits, such different input has already been successfully implemented. ” In a pioneering experiment, persons with bilateral vestibular dysfunction have been shown to efficiently use this tongue tactile sensory information to improve their head stabilization in space, indicating that they could substitute this augmented sensory information for the lack of vestibular sensory information to control head displacements.” Sensory Supplementation through Tongue Electrotactile Stimulation to Preserve Head Stabilization in Space in the Absence of Vision from Investigative Ophthalmology & Visual Science , January 2009, Vol 50 no 1 by Nicolas Vuillerme and Remy Cuisinier. These authors assessed the effectiveness of a tongue vibration biofeedback system as sensory substitution toward preserving head stability in 3 dimension space in the absence of visual output information. tongue by the electrode array, which is fabricated using industry standard photo lithographic techniques for flexible circuit technology and makes use of a polyimide substrate. All 100 electrodes (1.5-mm diameter, on 2.32-mm centers) on the 24 mm  24 mm array are electroplated with a 1.5-m thick layer of gold. The tether (12 mm wide  2 mm thick) connects the electrotactile array and accelerometer to the controller. The MEMS accelerometer, mounted on the superior surface of the electrode array, senses head position along the anteroposterior and mediolateral directions. Both the accelerometer and the associated flex circuit are encapsulated in a silicone material to ensure electrical isolation for the user.” Custom made software converted the head tilt signals from the accelerometer in the intraoral device into a dynamic 2 x 2 electrode pattern of elctrotactile stimulation, perceived by the users as a continuous buzzing, tingling sensation against the back of their tongue. I chose Jean Belliveu’s picture carefully hooking a chair for a very specific example. 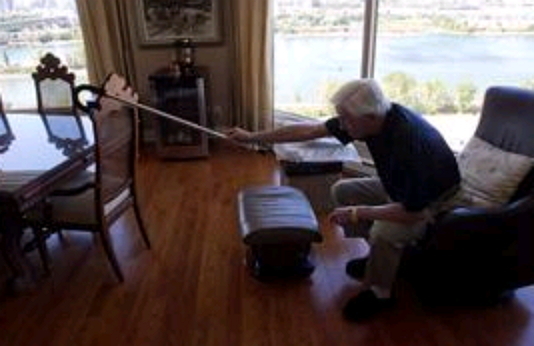 During his stroke rehabilitation, Belliveau reported difficulty getting his balance back, having to rely on the cane became a substitution toward holding his balance. A cane in the hands of a blind man sweeping a linear path in contact just in front of him is also a visual substitution for not seeing a room while entering it yet capable of finding the doorway to enter the room is also a substation for visually inspecting the doorway dimensions, the cane in this case acting as the visual substitution tool. I can’t help but wonder how Mr Belliveau’s recovery might have been if he had been given a vibrating tongue device telling his brain in its own language that he was re-learning to be upright with that tingling/accelerometer sensation acting immediately on his degraded balance. He may not have needed his cane to prop up his defective balance brain module, his tingling tongue balance would have recovered his erect unwavering posture.